Wide distribution of the survey was desired, so that a large number of responses could be analysed. The Down syndrome community is a physi-virtual community (Lazar & Preece, 2001), i.e. some families live in the same geographic area or are attending the same conference in a specific location at a specific time (physical community), whereas others are spread out geographically and can be reached only by mail or through e-mail or the world wide web (virtual community). Lazar (2006) suggests sending information about a survey to related newsgroups, bulletin boards or listserves, posting information on related websites, and distributing fliers (e.g., at conferences) to maximise the number of survey responses. To reach the physical and virtual segments of the Down syndrome community, information about participating in the survey was sent to parent support groups, and was posted on the websites of the National Down Syndrome Society, the National Down Syndrome Congress, and the Down Syndrome Education Online Advocacy Group. Some family support groups included information in their newsletters and their webpages. An active recruiting method (Lazar & Preece, 2001; Lazar et al., 1999; Marcell & Falls, 2001) was used to ensure wide distribution of the survey. Parent's ratings of speech intelligibility were correlated with whether they had received a diagnosis of oral motor skill difficulty or childhood verbal apraxia. Parents ratings of the speech behaviours observed in their children in daily life were analysed, to determine whether children who had not been given these diagnostic labels were demonstrating clinical symptoms of childhood verbal apraxia. Analysis of survey responses indicated that very few families of children with Down syndrome are being told that their child has childhood verbal apraxia or similar diagnosis. Only 15% of the over 1600 families had been given a diagnosis of childhood verbal apraxia by the speech language pathologist or physician although analysis of the survey results demonstrated that the characteristics of childhood verbal apraxia were evidenced in the speech of a majority of the children with Down syndrome. It was very rare for childhood verbal apraxia to be the sole speech diagnosis, i.e. childhood verbal apraxia was found to co-occur with oral motor skill difficulty in 98% of the children. This finding may indicate that the centres that are diagnosing apraxia are the ones that are alert to signs of both disorders, or it may indicate that both conditions are co-occurring. One possibility that would suggest co-occurrence is that the motor templates needed for speech which are typically developed through vocal play, are not being developed because of the low muscle tone and oral motor difficulties, thus leading to motor planning difficulties. Another theory is that the speech perception and speech production centers in the brain are not communicating well in individuals with Down syndrome. According to analysis of the survey results, many more children with Down syndrome show symptoms of childhood verbal apraxia than are currently being identified. 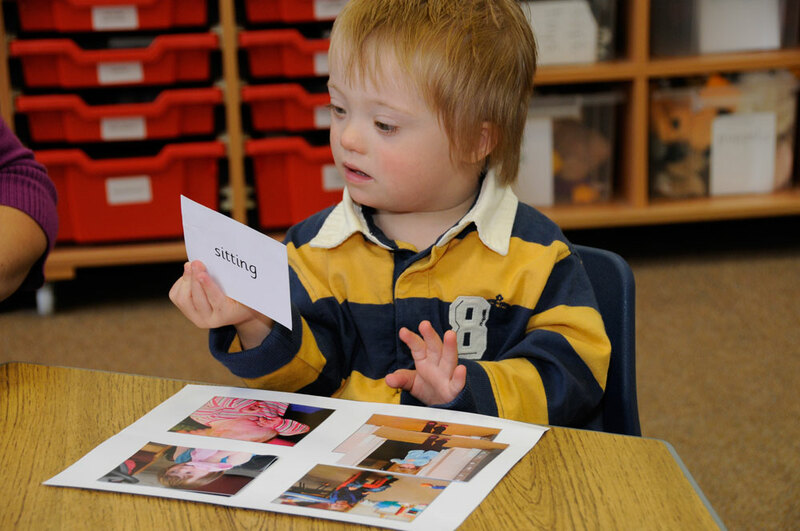 As a result, children with Down syndrome are also not being treated for these difficulties. This finding warrants further investigation. Although most children learn the sounds for speech by listening to and watching adults and other children around them and practice these sounds through verbal play, this is not true for children with childhood verbal apraxia. In children with childhood verbal apraxia, the skills needed to program and sequence the movements for speech must be taught and practised deliberately and often. Speech-language pathology treatment can focus on providing verbal practice and in partnership with families, an intensive home practice program can be developed. Since childhood verbal apraxia was found to co-occur with oral motor difficulties in all but 2% of the children, it is possible that early oral motor therapy will help develop the sound templates in the brain to lay the foundation to enable children to program and sequence the sounds. Early oral motor treatment can begin as part of feeding therapy, within the first 3 months of life (Kumin & Bahr, 1999; Pinder & Faherty, 1999). It can progress to using straws, horns, whistles, and musical instruments to help develop and practice oral motor skills (Oetter & Faherty, 1999; Rosenfeld-Johnson, 1999). If treatment begins later, therapy for childhood verbal apraxia will focus on teaching the child to produce each speech sound using visual-tactile cues, and providing daily home practice (Chappell, 1973; Kumin, 1999, 2002b, 2003b; Rosin & Swift, 1999, Square, 1999; Strand & Skinner, 1999; Velleman, 2003). The time for beginning this type of therapy will depend on when the child has the neurological maturity and motor skills to be able to imitate and produce the oral motor movements for speech sounds. Many children are able to participate in this type of treatment program by 3-4 years of age.